The word advent means “waiting time”, and if you remember a while back I shared a list of some things we would be doing with our kids as we await Christmas this year, but I wasn't sure just how to introduce those activities to the kids. Well, we found the answer in Melk, The Christmas Monkey! Remember, commercially, we don't have Elves on the Shelves (ad) in southern Mexico, and neither do we have Christmas Angels (ad), but we do have monkeys! When I saw Melk at the store, and Flower fell in love with him immediately, I knew he would be perfect for what we had in mind. We wanted something fun and meaningful for our family this year. 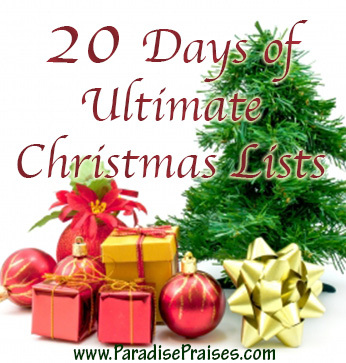 But more than just laughing at our “Christmas mascot” and cleaning up his messes every day, we wanted something that would teach our kids about God and focus our attention on Him. So, Melk became our first gift of Christmas this year, and with him came a letter explaining his name, and that he would be living with us through December to help us learn more about God. 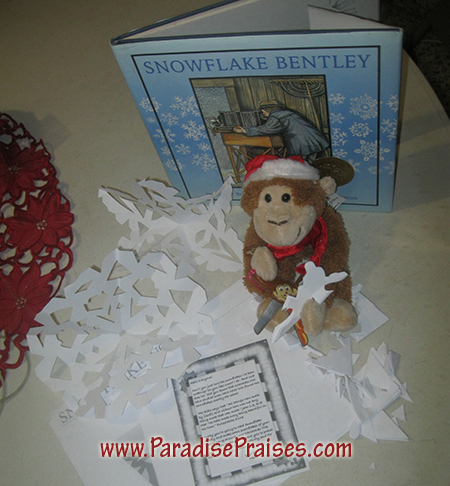 The introductory letter also explained that Melk is a mute monkey, so he communicates each day through letters. The kids were skeptical at first. Butterfly was indeed disappointed that he wasn't magic, like elves; and Flower and Sir have gone back and forth for days trying to decide if he is really “real” or not. But they and little Taz are up bright and early to find Melk each morning and anxious to hear what he has to teach us. If you've been following our Facebook page, I've been posting pictures there, and you are invited to share your Melk photos there as well. Here are some photos from our lessons with Melk. Each day's lesson focuses on a specific characteristic of God. Melk's letter explains that characteristic to us (using Scripture) and then he usually has some activity for us to do together as a family to reinforce the lesson or give us time to discuss it. Here are a few examples. Melk explained how God sends his angels to watch over us as just one of the many ways he cares for us. Melk showed us how to make paper angels. Melk explained how God delights in his creation and each one of us is unique just like the snowflakes he makes. No two snowflakes are ever the same! Melk gave us patterns to make our own special paper snowflakes. Melk explained that God gives us good gifts based on his love for us, not on our behavior. 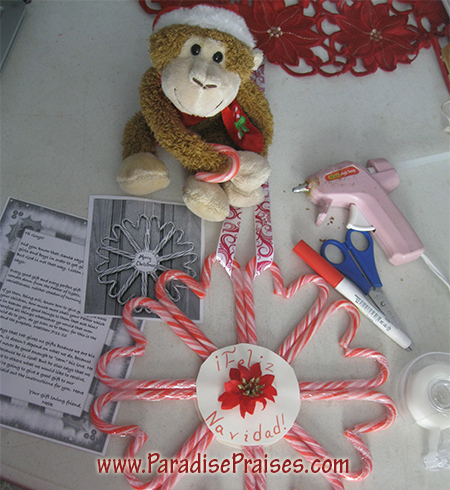 Melk laid out all the materials and directions for us to make a “good gift” candy cane wreath for a friend. What are you doing and learning during Advent this year? 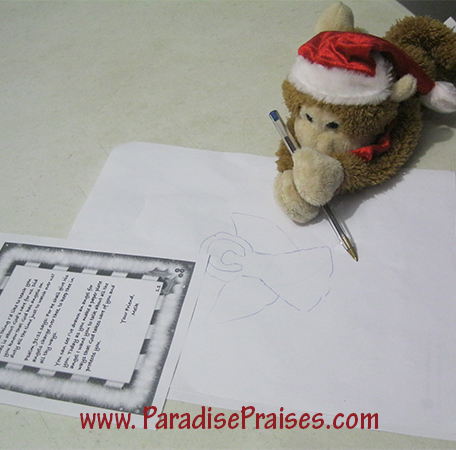 Want to know more about Melk, the Christmas Monkey? 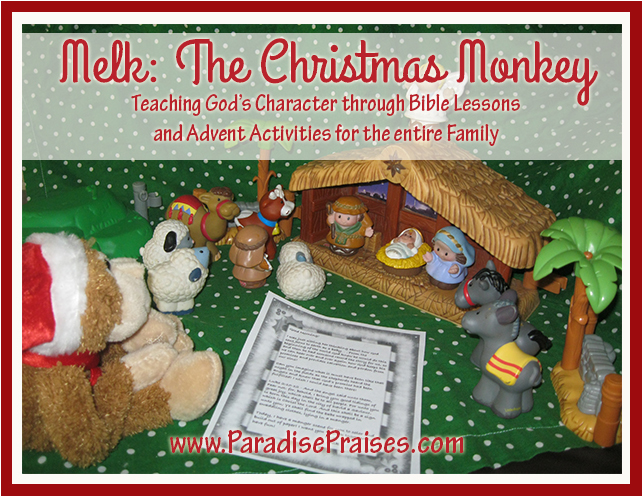 Melk, The Christmas Monkey, Advent Lessons and Activities is available for purchase now!